When people think of mobile advertising, the first image that comes to mind is a web-based mobile application. However, mobile advertising also means just that – advertising on automobiles and vehicles. When you display your company’s goods and services on sales or service vehicles as well, you immediately capture the attention of potential customers. In fact, you might say that a vehicle wrap is an attention-grabbing type of promotional tool as it makes any vehicle stand out from the other forms of transport. While a passing motorist may not [au much mind to a white van on the road, he certainly will take notice of a colorfully wrapped auto or truck. When you compare the cost of using a vehicle wrap to other forms of off-line advertising, you simply have to go the mobile route, especially when you look at the projections. For instance, let’s pretend you have $3,000 to spend. According to one leading graphics company, if you choose direct mail, you will reach approximately 3,000 addresses. In return, you will receive a response in the form of about 30 new customers. That is based on a worse-case scenario of a 1% return rate. Spend the same amount on home mailers and you will reach about 90,000 homes. Many people throw mailers away, so you will catch the interest of about 900 people. That does not mean all of them will buy your product or service either. If you spend $3,000 for a billboard ad, you will receive about 105,000 impressions and the same amount spent on radio advertising will return about 135,000 listeners in six weeks. However, put the same amount of money into a vehicle wrap and, according to experts in the industry, you’ll receive approximately 1.25 million impressions in just a year. Where do you think you should be spending your money? What’s more, if you spend $20,000, you will receive about 8.4 million impressions in the same span of time according to SignIndustry.com. Depending on the number of vehicles that your company owns and how often they are driven, you can reach tens to hundreds of thousands people per month. As a result, you can reach a broader audience than if employ other types of advertising. In fact, many businesses receive more customers from using vehicle wraps than advertising online. Although they are colorful and eye-catching, vehicle wraps are a non-aggressive form of advertising. The ads do not distract a person when they are listening or reading and people can spot your message without interrupting what they are doing. Today, if you are going to advertise off-line or online, you are not going to do well with an “in-the-face” approach. Vehicle wraps are not “spammy” or intrusive. They are simply a fun and enlightening way to business. When you use a vehicle wrap, you don’t have to wait for a customer to run across your ad online or in the newspaper or see or listen to your promo on the TV or radio. Vehicle wraps allow businesses to mobilely feature their products or services in parking lots and in varying areas of a community. 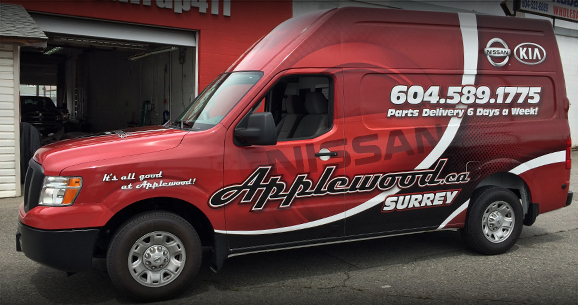 Unlike ads and billboards that consistently charge customers for their advertising, a vehicle wrap can be changed as often as you wish for a smaller out-of-pocket sum. Your initial investment costs a fraction of what other advertising methods charge and can generate results for a number of years. A vehicle wrap is a targeted form of advertising because you are reaching out to your local market. People like to deal with the businesses in their area. So, this form of advertising is a “win-win” form of promotion for both the business and the customer. The vinyl wraps used for ads also safeguard a vehicles’ body and framework from dents, road debris and scratches. Specialists can remove the wraps easily without harming an auto’s or truck’s paints. As a result, the vehicles remain in better condition and can be more easily traded or sold. Needless to say, you really won’t experience any downsides when you use a vehicle wrap to advertise your products or services. Most business owners feel they recoup what they have spent from the added exposure their company receives. If you want to make a wise advertising investment, then you cannot afford notto spend the money on wraps for your company’s trucks, vans or autos.